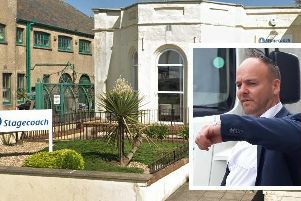 Six people appeared at Hove Crown Court yesterday charged in connection with the attack on Wayne Heys, which happened in Carisbrooke Drive, Durrington, on February 20. Mr Gardner said Mr Heys and his friend Ben Brooks had arranged to meet Howlett and Allen. He added: “The prosecution say Tommy Howlett and Bradley Allen were in effect lying in wait for them. “A number of other people were armed with knives and bats. The court heard that Howlett was carrying a small Samurai sword and Allen had a rounders bat. The prosecution told how Howlett shouted words to the effect of ‘leave him, he’ll be dead in a second’. Mr Heys was left lying in the street with life-threatening injuries, the court heard, and that Mr Brooks got Mr Heys into his car and drove him to hospital, where he underwent emergency surgery. His partner was told by doctors to prepare for the worst, the prosecution said. The case is expected to last up to six weeks. The trial continues.